It's no secret that I struggle with Adult/Hormonal Acne. I have discussed my views on the Clarisonic, OCM, Sulfur and Budget Conscious Acne Fighters. And while some of these products made my acne tolerable for a period of time, none of them solved my problem. 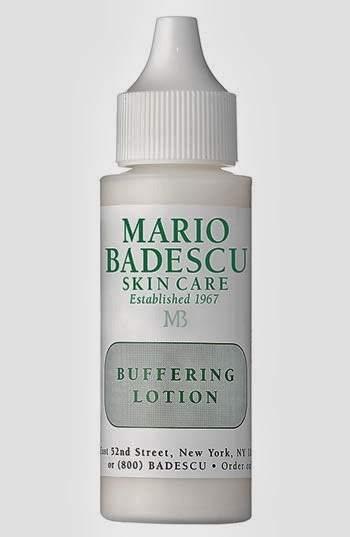 On a recent post about the OCM method, a fellow blogger Sheree, recommended that I try Mario Badescu's Buffering Lotion. I quickly began researching reviews about the product and found an overwhelming positive response about it. The Buffering Lotion, is not lotion at all. It's actually a watery substance with a large percentage of alcohol. The tipping point for me, is that this product is specifically marketed to target cystic acne. I have been battling cystic acne since my early twenties and there are so few products out there that are specifically designed for such an issue. I purchased the bottle from my local Nordstrom for $17. I know that might sound like a ton of money, but I am kind of desperate! Within the first couple days, I saw immediate results. This product completely obliterates my cysts! For those of you not familiar with cystic acne, it's not like typical white heads. I get welts under my skin (think of a mosquito bite). They are red, and painful to the touch. You cannot pick them, because A) they won't pop and B) it will only make them spread. I once read that when you try to pop a cyst that all it does is make the puss burst under the skin and causes it to spread into more cysts (sounds delicious right?!?). However, once I began using the Buffering Lotion, all of my cysts shrank, and they were brought to a head, which I could then pinch. After only a week, all my cysts were gone! I don't want to mislead you though and tell you my skin looks perfect now... I still have blemishes, but they're mostly all black heads and red spots. I assume the red spots are where the cysts would be, but the buffering lotion has kept them from becoming inflamed. 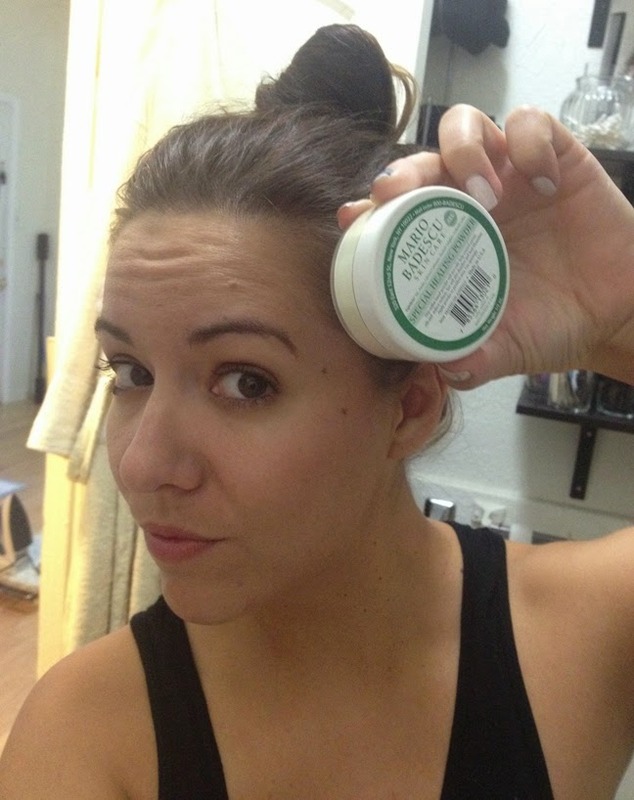 Now that I have finally found something to combat my cystic acne, I will seek out something for the minor blemishes! Some of the complaints I found online discussed the application of the Buffering Lotion. Since I read so many reviews, I kinda knew what to expect. As I said before, this is not a lotion at all, it's very watery. So when you apply it, shake it (because there are sediments on the bottom), and then I put the application tip directly on my blemishes. Don't squeeze very hard, otherwise the liquid will drip all over your face. Some people wrote about trying to put it on their finger first, but with the high alcohol content, it dries really fast. My method of tilting my head and applying directly has worked well since day one! The other thing I do differently than the recommended directions, is that I use this product 2x day. Some articles state to use is once/day or every other day, but I find that if I only use it once, a little cyst can sneak back up. Some people complained about it drying out their skin, but I have not found that to be true for me. I have been using the buffering lotion for 10 weeks now, and I am on my third bottle (I go through a bottle/month). 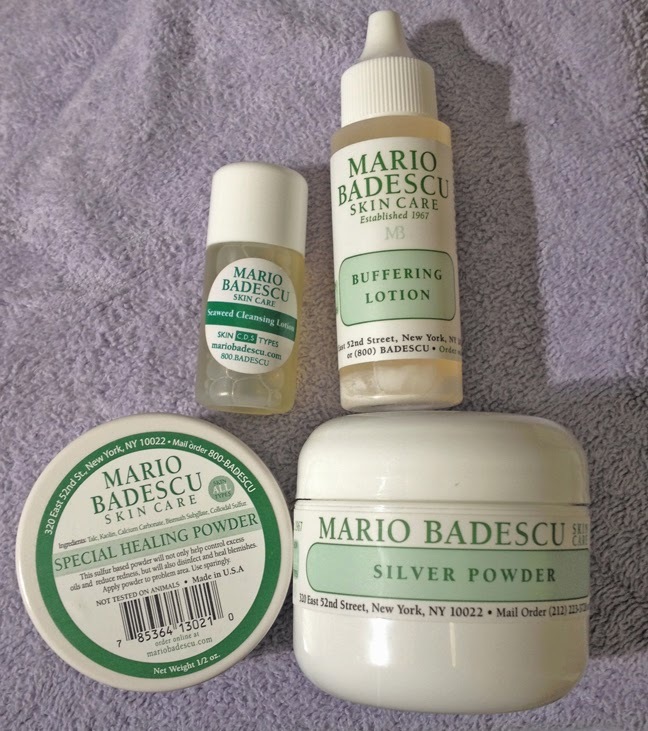 I love the Buffering Lotion so much that I have began testing out other Mario Badescu products! The Silver Power is great at minimizing your pores, and the Special Healing Powder is amazing at reducing oil. The Seaweed Toner, is a sample, so we will see what wondrous things it does!! I just got this Special Healing Powder yesterday, but I am already sold! I put it on last night, and woke up this morning without any excess facial oils (that's huge for me). Then, I put it on under my make up today and there has been NO shine all day!! I'm usually a greasy monkey within a couple hours, but this stuff is keeping me matte all day! In just a couple months I have become a full blown believer in Mario Badescu products! I am so grateful to Sheree for telling me about this line! If you struggle with blemishes of any kind, I highly recommend trying this line! I told you!!!!!!!!!! I am so excited to hear this! I am so glad you trusted me enough to try it...so happy for you, I know how good it feels...trust me! Thank you for sharing! I have dealt with the cystic acne and it is very painful! After I had my son, it went nuts! I am going to have to try this. I hear great things about the Silver Powder and I am personally obsessed with their Drying Lotion and Hyaluronic Eye Cream! I've never heard of the Buffering Lotion though! I need to try this! This is a great post! I also suffer from cystic acne and your honest review has really convinced me to try it out! Also, love that you shared a bit about the other products too! Just placed my order for the healing powder, buffering lotion and drying mask! My hormonal acne has gotten out of control (again!). Hoping I have similar results!